Thai GDP growth has been 3-4% per year in the past few years. Beauty and Personal Care is one of the fastest growing consumer goods, growing well above the country’s GDP at 6.6% per year between 2015-2018. There has been slight economy slow down, major political turmoil, drastic energy price swings, but these consumer goods – Beauty and Personal Care – has constantly been growing. People wash themselves, wash their hair, put on skin lotion and makeup every day. However, consumer demand gets more sophisticated. Product offerings and distribution channels therefore need to catch up. Beauty and Personal Care market in Thailand is projected to have a healthy growth of 7.3% per year – surely exceeding the country’s GDP growth rate – from 2019 to 2022. Comparing to selected key countries in Asia-Pacific, Thai market is of a significant size, $6.2 billion in 2018 and is expected to reach $8.0 billion in 2022 – smaller than countries like China, Japan, India, South Korea and Australia but ranks no. 1 in Asean. Very high growth​ ​rates 2019 to 2022 are Indonesia, Malaysia, Vietnam, India, China​ and​ the​ Philippines having 11.9%, 9.8%, 9.0%, 8.7%, 8.5% and​ 7.5% per year, respectively.​ At high level, China and India are very attractive markets having large market​ values, $58.8 billion and​ $14.5 billion​ in​ 2018, and​ growing rapidly.​ At smaller locality level, countries likes Vietnam, Malaysia and Indonesia could be more reachable for​ Thailand​ in​terms of​ logistics​ and​ market​ environment.​ Customer preferences or insights are expected to differ not​ only from​ ​one country to​ another (e.g.​ Muslim customers in​ Malaysia and​ Indonesia)​ but​ also between sub-segments (e.g.​ young labor in​ Vietnam). Observation on​ markets​ with limited overall upside: Japan, South Korea​ and Taiwan. 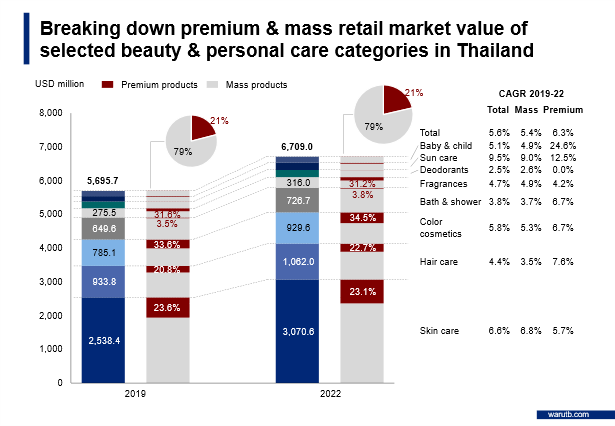 Breaking down sub-categories of beauty and personal care market in Thailand, all sub-categories present healthy growth rates 2019 going forward to 2022. The lowest growth is Deodorants having 4.1% per year, still above the country’s usual GDP growth, the highest growth is Sun Care presenting very attractive 11.2% per year. 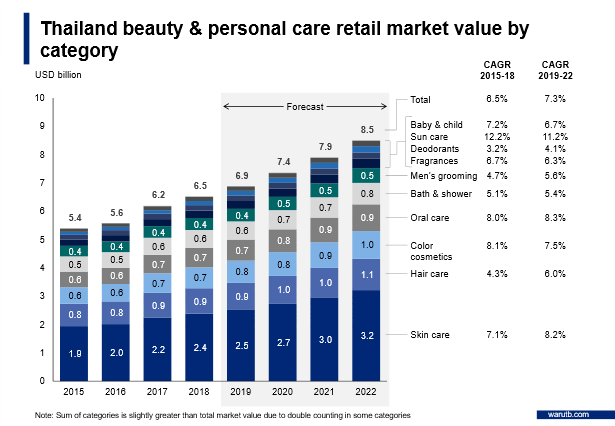 Top 3 largest sub-categories by market value are Skin Care, Hair Care and Color Cosmetics having $2.4 billion, $0.9 billion and $0.7 billion in 2018, respectively. Sophistication is in the details. For example, a significant portion of demand is driven by inbound tourists especially Chinese and other Asians who like to buy Beauty and Personal Care products back to their home countries. 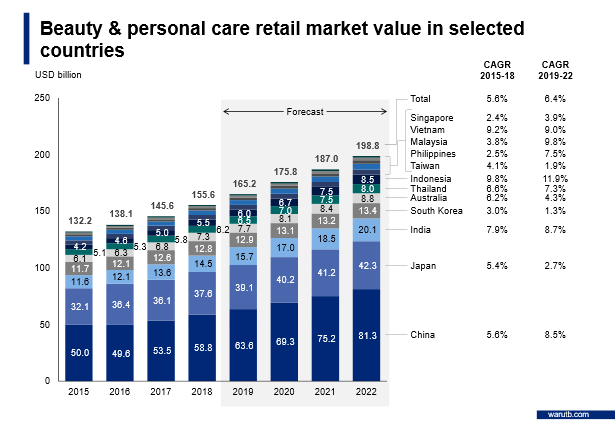 Another example is ageing population segment which presents a growing demand making brands strive to find new product offerings, especially in Skin Care and Oral Care, to capture this segment needs. Also, a growing consumer preference towards natural and organic products. The nature of these consumer products are of many different aspects trying to meet the needs of target consumer groups. It would be interesting at least to get some granularity around mass vs premium tiers. Breaking down each category into mass and premium tiers, mass tier is the majority of all categories. However, premium tier takes significant portions in Color Cosmetics, Skin Care and Hair Care. Looking at 2019 and 2022 projection, the overall market value of the categories expand but premium portions remain relatively the same from 2019 to 2022. Breaking down each category into mass and premium tiers, mass tier is the majority of all categories.  However, premium tier takes significant portions in Color Cosmetics, Skin Care and Hair Care. Looking at 2019 and 2022 projection, the overall market values of the categories expand but premium portions remain relatively the same from 2019 to 2022. Grocery retailers such as Tesco Lotus and Big C, or specialist retailers such as Watsons and Boots have their own private label brands, normally located on the shelf next to other brands, aim to offer a more budget choice for consumers. Premium product offerings need to be dynamic adjusting to meet the dynamic, not to mention sophisticated, consumer demands. Key opportunity segments for premium tier are such as natural and organic products, or anti-ageing products. Looking at distribution channel of Skin Care, Hair Care and Color Cosmetics – the 3 largest categories in beauty and personal care, broadly, the main channels are store-based. However, non-store based direct selling also plays as a key channel for Skin Care and Color Cosmetics. Online shopping, although consumers are getting more open and brands are keen to introduce their online stores in the past few years, the sales through online channel is still relatively small compared to traditional channels. There has been rising attention for multi-brand stores offering a wide variety of brands with tiers ranging from mass to high-end. Multi-brand stores are such as Sephora, Beautrium, Stardust, Beauty Market and Lashes. What about the level of market consolidation (or fragmentation)? Let’s look at no. of companies that comprise 80% market share in Skin Care, Hair Care and Color Cosmetics. 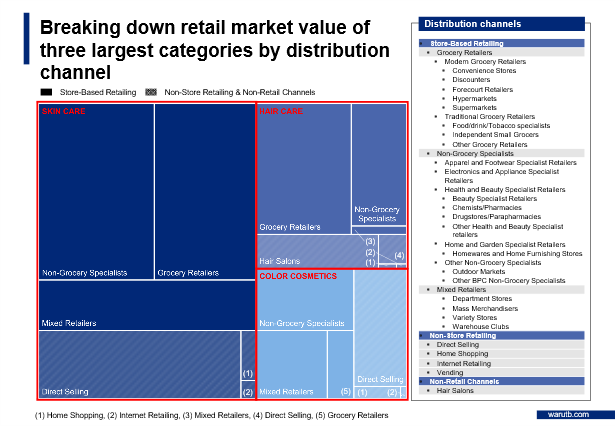 It looks like Hair Care is more consolidated having 8-11 companies to make up 80% of the market. Also, the few largest companies account for 50-60% of the market. Skin Care and Color Cosmetics are already more fragmented, compared to Hair Care, having 15-20 and 12-20 companies to comprise 80% market share. 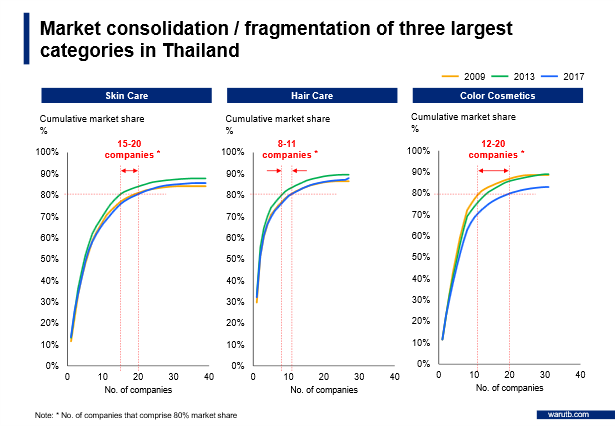 Color Cosmetics is relatively more consolidated than Skin Care having key large players taking sizable market shares. However, comparing the data of 2009, 2013 and 2017, all three categories – Skin Care, Hair Care and Color Cosmetics – are moving towards more fragmented market with Color Cosmetics having the most obvious trend. There have been constant influx of new entrants offering new products targeting specific niches. Consumers are sophisticated thus there are always new niches to be found.